Alright. We're sick of Slytherins getting a bad rap. If you get sorted into Slytherin house it's all "That's where the evil wizards go" and "wow, you must be evil." Give us a break, alright? It's not like the Sorting Hat is made to look for bad behavior. It's not all like "Hm. You have the potential to be an evil twit. I'm just going to put you over here for safe keeping." Yes, okay, so there were some bad eggs in Slytherin House. But it's not like they only came from Slytherin! As far as we can tell, all the other Hogwarts houses had jerks too. And maybe the Slytherins were just a bit defensive from everyone assuming they were evil. Ever think of that? Probably not (we're looking at you. Gryffindor). Ever see the Slytherin House characteristics? It's not "lying, malicious, evil, and jerks" contrary to popular belief (still looking at you, Gryffindor). What it actually says is: ambition, cunning, resourceful, and determined. You know what that means? Slytherins are practical. Slytherins get things done. Slytherins are people smart and situationally aware. And yes, maybe we are tad bitter that we're over here getting our work done whilst others are off breaking rules and up to no good (*cough, cough* Gryffindor) and all the while we're the ones with the bad rap. Well, no more. So this is for you Slytherins out there. 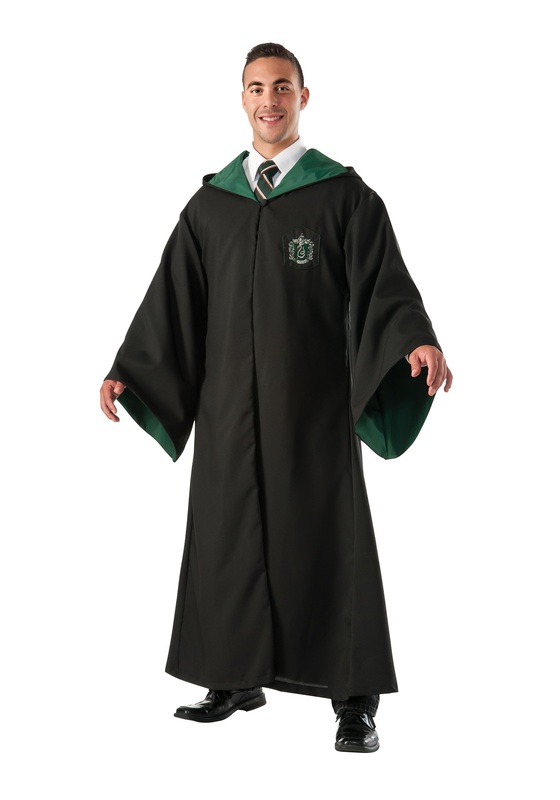 A full replica Slytherin Robe to show off your colors. It's got the Slytherin House crest and full hood. Stand proud, Slytherins. Cause hey, you're from the house of Merlin after all. And really, everyone looks great in green.